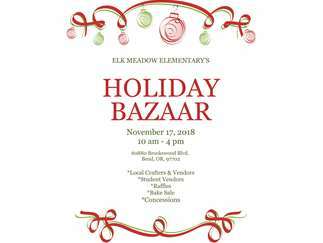 Elk Meadow is hosting it's first ever Holiday Bazaar! Local crafters and vendors will be filling the gymnasium selling that perfect holiday gift. Elk Meadow students will line the hallways selling their crafts as well. If that wasn't enough, Elk Meadow PTO will also be there selling concessions and hosting an awesome raffle consisting of prizes from each vendor! You can also enter to win an amazing evening away at Sunriver Resort! Join us for what is sure to be an amazing event!